When you have a good lie but you need to make the ball climb quickly and stop quickly, here's a sort of trick shot to try. I learnt it from the game's finest shotmaker, Seve Ballesteros. It's played from the same address position as a basic bunker shot: open stance, open, laid-back clubface, ball positioned off the left instep. The backswing is also the same as for most bunker shots, a wristy, pick-up of the club. 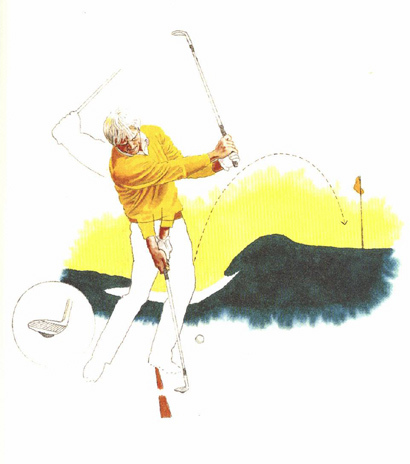 On the downswing, however, the secret is to loosen the grip in the last three fingers of the left hand. Don't let go - just lighten up on the grip pressure, to allow the right hand to flick the club quickly under the ball and upward, raising it sharply into a high, floating flight. One warning: Don't try this except from a clean tie. When you loosen your grip there's a chance that the sand will grab your club and keep it there, along with the ball. For this reason also, be sure to swing through firmly and fully.